Sufra NW London’s latest exciting venture is now live: Oh Crepe! – our super-tasty, sweet and savoury crepe stall. The new initiative will provide local employment opportunities for Food Bank guests, whilst also generating income to help keep the Food Bank and Community Kitchen fully operational. 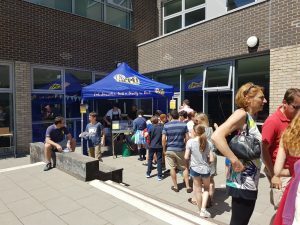 Our initial pilot at the Lycee International’s Summer Fair was a resounding success – we sold around 200 crepes to a discerning French crowd, and they loved them! We also made a tidy profit, so we are keen to do the same at other events in the coming months – get in touch if you know of any. 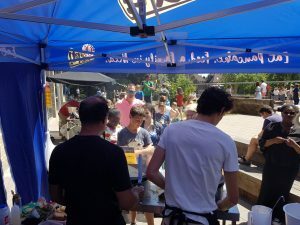 In the meanwhile, we will be serving crepes every Wednesday afternoon at the food market outside Brent Civic Centre – come by and say hello. Better still “Eat Pancake and Feed A Family in Need”, as we say on our strap line. Would you like to be Crepe Volunteer? Without a small team of volunteers to help run the stall, we would struggle to make it financially viable. We need help preparing ingredients, setting up the stall, taking payments, assisting chefs during service, clearing up and dismantling the stall, and clearing everything away back at Sufra HQ. It’s hard work but really great fun (and you get free crepes!) – please get in touch if you would like more information about the shifts available – email admin@sufra-nwlondon.org.uk or call the office.